First came the exploding van window. Then came the bed bugs. Then the rain and faulty brakes. 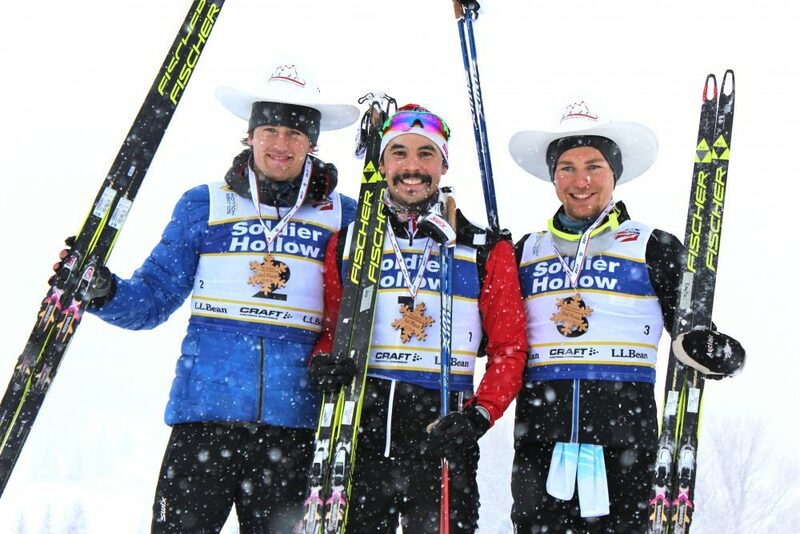 Yet despite harsh race conditions and unexpected SNAFUs, the Alberta World Cup Academy emerged with five medals from the U.S. Nationals in Soldier’s Hollow, Utah Jan 7-12. 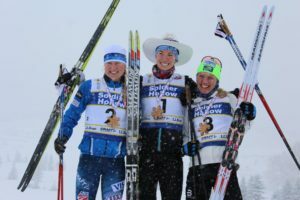 Dahria Beatty, Knute Johnsgaard, Julian Locke and alumnus Jesse Cockney all broke through the stiff competition to earn medals, including a podium sweep in the men’s skate sprint race on the final day of competition. As she’s done all season, the unfailingly reliable Dahria Beatty led the way for the AWCA skiers, scoring a gold medal in the skate sprint on Jan 12, and recording two fourth place finishes – one in the classic sprint qualifier and another in the heats. Racing against huge fields of top American racers, the Canadians weren’t insulated from tough races, and suffered mightily in the first few days of racing. The Academy took a slightly different approach to U.S. Nationals than most teams, which Jeffries feels paid off later in the week. “We didn’t spend as much time at altitude as the other teams beforehand. We thought that would provide us with a better recovery. That served us well and we had good energy at the end,” Jeffries said. The trip was originally challenged when the team’s van window blew out in between Canmore and Utah. The Capital Region Training Group athletes then had to be moved out of their rooms, after bed bugs were discovered in their accommodations. Weather provided a mix of heavy snow and rain, creating some of the most difficult waxing conditions possible. Bad brakes also complicated trip logistics for the Canmore crew. Compared to the NorAm circuit, the Academy didn’t have as much success on the results board. But Jeffries said the team must expose itself to tougher races if it wants to reach elite levels. This was the first time in six years Canadians sent a large contingent to U.S. Nationals. The results will be used to chose Canada’s world championship and U23 team. Beatty, Johnsgaard, Locke and Cockney put themselves in a good spot for selections. Cross Country Canada is expected to announce its team in the coming days. As for the AWCA U21 athletes, Jeffries said illness did strike the group right before the race season, but Jeffries is challenging them to step up in the next group of races. “The U21 group were left wanting more at the end of the week. I thought they had a good lead-in to the races. Three or four of them got sick and it made it impossible to get results,” Jeffries said. 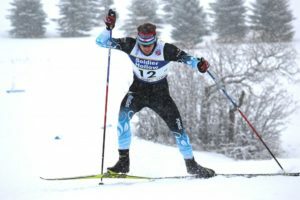 Western Canadian Championships in Whistler, BC are coming up, and the U21 athletes see that as a chance at redemption. “With the guys, I had a meeting with them. The first half of the season hasn’t gone the way they were hoping for. There are lots of races coming up and it’s time for them to show what they’re capable of. They didn’t do anything wrong at U.S. Nationals – sickness caught up to them, so we’re not inclined to make wholesale changes. I’m confident we took the right approach. But Westerns can be their starting platform,” Jeffries said. The young team did see excellent racing from Delphine Duvernay-Tardiff. The young athlete just missed the sprint qualifier, finishing 32nd, and battled in the 20 km. The youngest sister of Kansas City Chiefs guard Laurent Duvernay-Tardiff impressed her coaches with a great attitude and competitive spirit. “Delphine was a bright spot. She just missed in the classic sprint and was in a good head space the entire week. She’s looking forward to racing and in a very positive spot,” Jeffries said.